USA or Thailand: which country is more expensive? 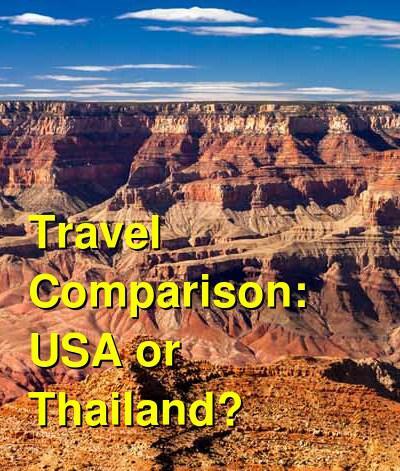 This comparison of travel costs between Thailand and the USA examines average prices across multiple categories. Please visit each country's individual budget page for more detailed information. Should you visit the USA or Thailand? Thailand offers a great deal for visitors, most of all great beaches in an exotic and tropical atmosphere. On the other hand, the United States offers a diverse set of attractions, but lacks the tropical atmosphere and jungles of Thailand. If you're an American deciding whether you should travel internationally or domestically, then a large part of your decision may come down to cost. Surprisingly, if you travel independently abroad, it is often more affordable than traveling within the United States. Depending on where you go, you can often find cheaper accommodation, particularly if you're a budget traveler and willing to stay in hostels. Even if you want higher end accommodation, great deals are often available. When is the best time to visit the USA and Thailand? 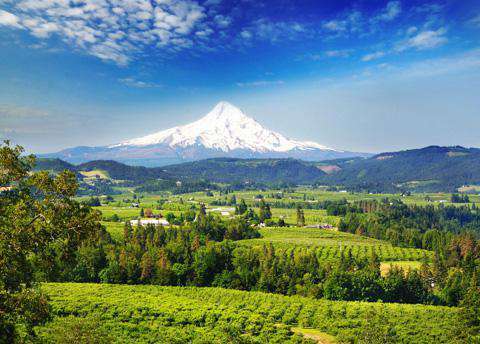 The United States is a vast country that covers a wide variety of landscapes and climates. You can really find somewhere to visit any time of the year. The southern United States and parts of California are lovely places to visit during the colder winter months, as temperatures are still fairly warm. Many cities also have interesting holiday decorations if you're planning to be in the country during that season. Skiing and winter sports are also popular in the mountains. Summer months can become very hot in the southeast, but the northern states are often quite pleasant, even during the hottest months. In general, national parks are most crowded during the summer months. Visiting the busiest parks during the shoulder seasons is recommended if you want to avoid the crowds. Why is the USA more expensive than Thailand? In general, the U.S. is an expensive place to visit. The high cost of living and the vast size mean that transportation costs can be quite expensive. If you really want to see a lot of the country, flying is really your best option. Amtrak is the most well known train system, but it is limited to where it goes and prices are quite high. In some situations, flying is cheaper than taking the train. If you want to explore the country's impressive national park network, a rental car is a must. Hotels in the United States are also quite expensive. There are very few hostels throughout the country, particularly when compared to European countries, so accommodation prices can be more than you might expect. If you're driving, there is an extensive network of budget hotels along the interstate highways, so prices between cities can be reasonable. Despite being one of the most visited destinations in Southeast Asia, Thailand's overall economy is based on tourism and agriculture instead of higher-end services or manufacturing. Because of this, travelers benefit from the overall lower cost of living leading to less expensive travel prices. Budget accommodation in Thailand is everywhere, and the food is cheap, too. Activities are also affordable due to the generally lower wages across the nation. What are the most expensive and cheapest cities and regions in the USA and Thailand? In the United States, the larger cities are some of the most expensive places to visit. New York City and San Francisco are notoriously expensive because of their high hotel costs and expensive restaurants. Still, there are plenty of affordable restaurants in these larger cities, so it is possible to save some money. Free entertainment in the larger cities can be common, and this can help you keep costs down. How you can save money when visiting the USA and Thailand? Many larger cities in the US have cheap public transportation systems that can save you money. Consider this when you plan your trip, especially if you intend to rent a car for a portion of your trip. In Thailand, find local transportation (the government buses) whenever possible and avoid paying a premium for tourist or "VIP" buses. Often, the government bus station will be in the center of town or separated from the tourist areas. Hotels in the center of cities are more expensive, so look for options that are a little further out, especially if public transportation is available. In the US, making reservations for hotels will usually save you money. Shop around for the best prices. Negotiate hard while in Thailand. However, in the U.S., negotiating is not done as prices are set. Slow down. If you're rushing through the area you're going to spend more money. Transportation costs can be somewhat expensive, so the more places you visit, the more money you're going to spend. Plan your trip schedule carefully, as festivals are fun but expensive. If going to the Full Moon Party isn't your priority, avoid the island areas during these times. Also look at the holiday schedule to see when locals are on vacation.